Coming together with those furthest behind to build an inclusive world of universal respect for human rights and dignity. This is the theme for the 2018 International Day for the Eradication of Poverty. How are we eradicating poverty in Ethiopia? 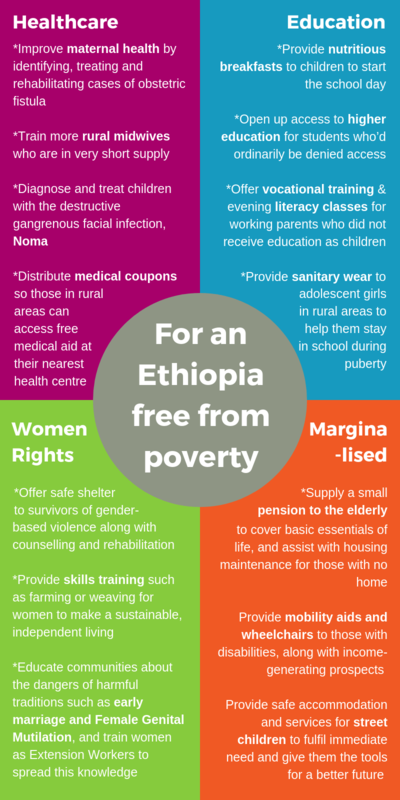 To help those furthest behind in Ethiopia, we are tackling key factors which condemn people to a life of poverty – factors like lack of healthcare, limited education, lack of women’s rights, and insufficient support for the marginalised. Access to quality healthcare – particularly maternal healthcare – is a fundamental part in breaking the cycle of poverty. Without medical attention, those who are sick or suffering from a chronic condition have no way to change their circumstance. On top of this, maternal health conditions such as obstetric fistula are very socially isolating, so without access to healthcare or even knowledge that treatment exists, those who suffer are often forced to live on the fringe of society; denied employment, and reliant on handouts from relatives with no way to provide for themselves. This ties into themes of women’s rights – women face unique risks to their health and livelihoods such as early marriage, Female Genital Mutilation and gender based violence, which restrict them from living an independent life and limits their capacity to achieve their full potential. Correspondingly, there are other marginalised groups in Ethiopia’s society – such as the elderly, orphans and those with disabilities – who are often neglected or exploited. People with disabilities are routinely denied their most basic human rights; cut off from education, employment, and healthcare, and often living in extreme poverty; while the elderly often have no access to state pension, never earned enough to save for their old age, and so become either reliant on family support or are forced to beg on the streets. Finally, education is the lynchpin that ties this all together. By providing the opportunity for education – in the form of both formal schooling and informal skills training – this gives people from every walk of life the tools, skills and knowledge to build better prospects for employment, income and self-sufficiency well into the future, and tackle the cycle of poverty from the ground up.